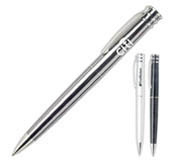 Our pen engraving service has proven to be a great attraction for trade show traffic building, give-a-ways and promotions. 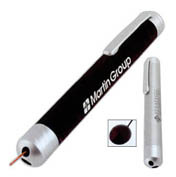 Our compact engraving system engraves pens in seconds with only one operator at each station. It eliminates traditional waiting time for engraving and provides potential clients and attendees with a personalized promotional gift that they can take home. We can provide on site pen engraving services and other traffic building promotional products for trade shows and corporate events. We provide the machines and technicians capable of engraving thousands of products directly in the clients booth to maximize sales and guarantee marketing success. We have a very successful marketing program targeted to attract trade show attendees to our clients booth and keep them entertained while the client's sales and marketing people present their sales pitch. Gun metal carbon fiber solid brass ball point pen with special patterned barrel design. 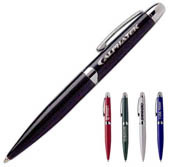 Shorter twist action retractable metal ballpoint pen with silver accents.Perfect executive pocket pen. Black ink only. Each pen comes in individual cellophane. 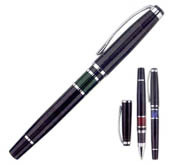 Stylish European look pen and pencil set with a 24 hole grip design. 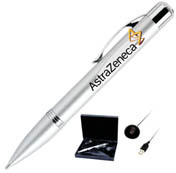 Features a push action retraction ballpoint pen with black ink only. Mechanical pencil is 0.5 mm lead. Gold/Silver Accents. Features 24 Karat gold plated clip and a comfortable thick rubber grip. Guaranteed long life cartridge. Gold Accents. Blue ink only. Brass cap off roller pen with elegant lined barrel design.Brass pen available in black & silver. Price includes one location laser engrave or one color silk screen imprint. 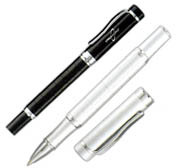 Twist action solid brass cap off rollerball pen with lacquer finish and acrylic middle trim. 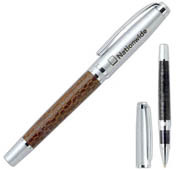 Cap off roller ball solid brass ballpoint pen with leather barrel and silver accents. We can pre-load your data on our USB Drives at the time of your order! Data Load – great for marketing, photos, slideshows. 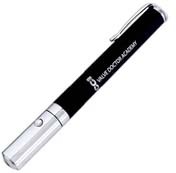 Brass twist action pen with slide show presentation remote control and laser pointer. Allows you to venture up to 15 meter from the computer while still being able to change slides. It comes with a transmission receiver plug. 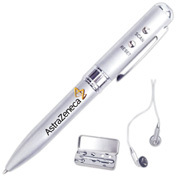 Silver finish brass pen with chrome accent and built in radio. Packaged in silver metal case. Gunmetal - Solid brass twist action ball pen. Price includes one location laser engrave or one color silk screen imprint. Combo MP3 & USP Pen. 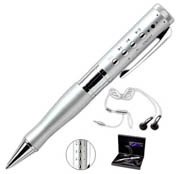 Cool brass combination MP3 player and twist action pen with 256MB, extra refills and elegant black gift box. Perfect for anyone on the go. Easy data storage and transferring MP3 files, plugs into any computer via USB. Store approximately 100 normal length songs. Lightweight, solid brass construction laser pointer. 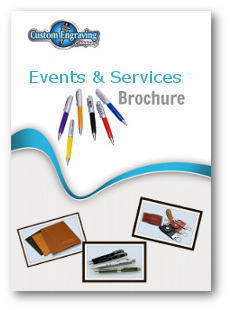 Contemporary design will showcase any logo. Advanced laser diode with 300+ yard range. Includes 2 replaceable AAA batteries. Two-in-one laser pointer with remote control. Satin silver finish on cap and pocket clip. On / Off functional button for laser pointer. Power point up and down button with a translucent receiver, cord and USB plug. For more information on our on-site event engraving services. CLICK HERE! .